Depicted in the photograph is Arad Thomas of the Thomastown section of Middleborough harvesting cranberries in the late 19th century. Prior to the early 20th century, the harvesting of cranberries was a labor intensive occupation. Though scoops of various sorts were employed to remove the berries from their vines, their effectiveness varied and picking by hand remained for many years the most practical method. 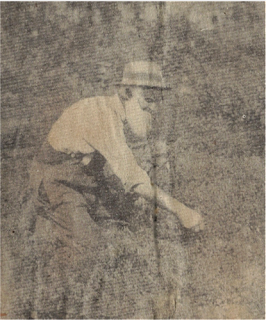 Though the photograph captures Thomas as a solitary picker, the annual harvest in September, October and sometimes early November, was a communal activity, with residents working together to harvest cranberries from neighboring bogs, many of which would be sectioned off for the picking process. Arad Thomas, newspaper halftone, Middleboro Gazette, "Old Middleborough", December 17, 1926, page 1.